Breakfast was great. Made especially for us every morning. Fresh orange juice, bread, eggs, coffee, tea and more. Everything is very clean. Rooms a big and balcony with a wonderful seaview. The owners are good. The son speaks excellent English, but the parents don't, but that doesn't matter. It is always possible to communicate. Excellent location on the beach, very good breakfast, and the owners were so nice and generous. The room was large, simple but comfortable. Great little hotel opposite the beech. Clean, large rooms with balcony, tv, cooking facilities, fridge and sink. Excellent value for money. The hotel is really nice, comfortable, located in a quiet place aside from the port and the night life (5-minutes walk) and right by the sea! Rooms a spacious and clean, bathroom is quite good and the water in the shower goes through ok (this is a usual problem in the small hotels). Hosts are very nice and helpful (they don't speak English though but it works somehow). There is even an elevator in the hotel so you don't have to worry about getting your staff on the upper floors! The location, the beach and the warm sea with hot springs flowing into it. I have stayed in this hotel several times before and always enjoyed my stay. The staff do not speak English but they are very pleasant and welcoming. Excellent Location, the room was in front of the beach, we slept on the wave sound, it was super relaxing and comforting. The hotel is in a great location for the early morning ferry with a pleasant sea view. Really good value for money, BEAUTIFUL location and view from the balcony. 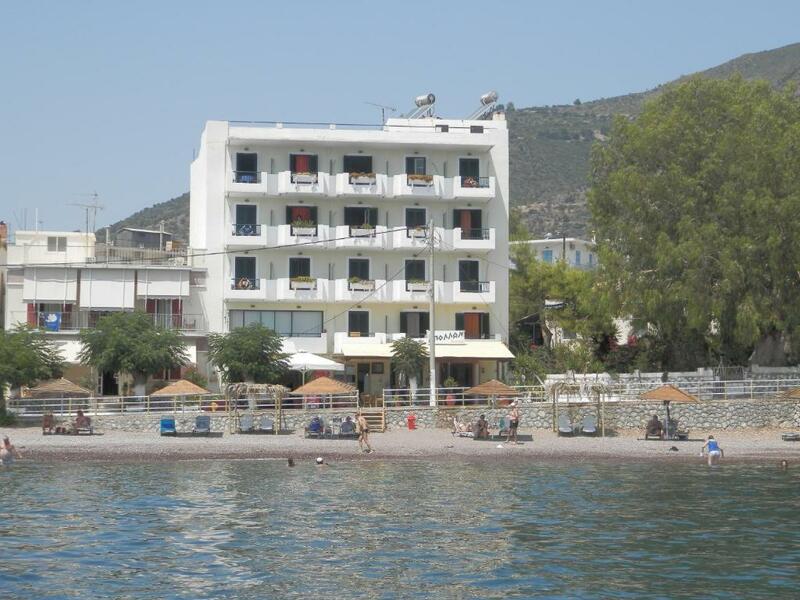 Apollon Hotel This rating is a reflection of how the property compares to the industry standard when it comes to price, facilities and services available. It's based on a self-evaluation by the property. Use this rating to help choose your stay! One of our top picks in Methana.Located in Methana, the beachfront Apollon Hotel offers self-catering units with free WiFi and views over the Saronic Gulf. It lies within 650 feet from the port and 1,000 feet from Methana Thermal Springs. Opening to a balcony, the air-conditioned studios of Apollon have a well-equipped kitchenette with dining area, fridge and cooking hobs. A TV and a private bathroom with hairdryer, bathrobes and free toiletries are available. Guests can enjoy breakfast on request and at extra charge. Restaurants and bars can be found within 150 feet from the property, while a mini market is 1,300 feet away. The seaside Palaia Epidavros is 24 mi from Apollon Hotel, while the Ancient Theater of Epidaurus, where artistic events take place during the summer, is 27 mi away. Methana Volcano is 7.5 mi away and Athens City is at a distance of 102 mi. Free public parking can be found on site. Air-conditioned studio with free WiFi and a balcony overlooking the Saronic Gulf. It features a kitchenette with dining area, fridge and cooking hobs. A TV, a hairdryer, bathrobes and free toiletries are also available. Apollon Hotel βρίσκεται στην παραλία Μεθάνων μόλις 300 μέτρα από το λιμάνι, είναι σε απόσταση 15 μέτρων από την θάλασσα και κοντά στην αγορά. Το ξενοδοχείο μας παρέχει δωρεάν WiFi είναι διαθέσιμο σε όλο το ξενοδοχείο. Τα δωμάτια είναι εξοπλισμένα με τηλεόραση επίπεδης οθόνης. Υπάρχει επίσης μια μικρή κουζίνα, εξοπλισμένη με ψυγείο. Οι επισκέπτες μπορούν να απολαύσουν ένα ποτό στο σνακ μπαρ του ξενοδοχείου ή στις μεγάλες βεράντες του ξενοδοχείου μας με θέα τον Σαρωνικό. Στην γύρω περιοχή μπορείτε να βρείτε εστιατόρια, ταβέρνες. Σε απόσταση περίπου 500μ είναι τα λουτρά Μεθάνων (Methana Volcanic Spa), 2 γήπεδα για αθλητισμό και πολλές παραλίες. Location stunning Moon and Some of. The room was nice and the breakfast very good, however, the hotel took the amount for the booking twice from my credit card, acknowledged its mistake, but is not doing anything to transfer the money back! They are not even responding to my e-mails anymore! This is unacceptable! Will definitely not recommend this place - which is a pity, because it is quite nice. The only problem is that the balconies are small and they are not separated from each other enough so that you kinda sit there all together with all other people on your floor. I guess this can be easily fixed. Showering was a bit uncomfortable, the bathroom quite wet after, but all in all in good shape. Only one beach, 1,5 klm away from the hotel. No sand in any place. Hazard sings everywhere "Swim at your own responsibility".Rocks and Seaweed everywhere! Crazy cats, annoying wasps, rude, indifferent people. A "dead island". Hard mattresses and noisy fridge made in 1985 in the Soviet Union.